If you’re hunting for inspiration for your own home cinema project, or thinking of engaging a professional outfit to work its magic in your house, then there's no better place to start than the annual CEDIA Awards. Each year, they highlight the very best custom installations from the UK, Europe and beyond, covering everything from affordable media rooms and dedicated cinemas to whole-house makeovers, eco projects and even the crazy world of hi-tech yachts. There are many things you could do with a 'disused' room in your house. Install a gym, house a collection of rare snakes, set up a tiny restaurant... Or you could opt for your very own high-end cinema room. To us, and the owner of this four-seat movie den, that's the obvious option. If your attic is currently used to store Christmas decorations, old Scalextric sets and musty suitcases, it’s fair to say you aren’t putting it to its best use. Maybe the sight of this alluring loft-based home cinema will spur you on to build your own top-floor movie den. 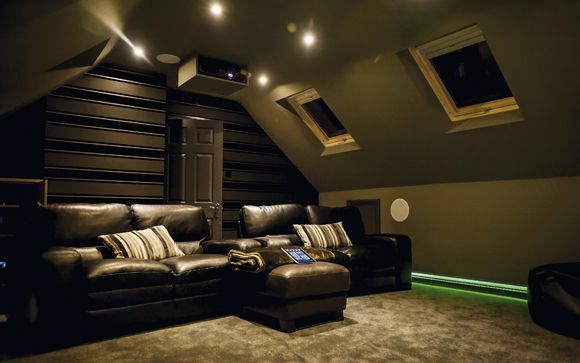 The proud owner of this stunning cinema room in South Africa – complete with unique 5000-element fibre-optic star ceiling – is a true movie-holic, to the point where the cinema was the first room to be completed during a comprehensive home-renovation project. In fact, the property already featured a home cinema, but during initial discussions with installer Sphere Custom it became clear that the existing room would not accommodate what the film-mad owner had in mind. It was decided instead to start from a ‘clean slate’, and a dedicated extension for the proposed 12m x 7m room was constructed. This issue’s pro install reflects a common concern – how to harness wasted loft space. The brief here was to indulge the owner’s passion for enjoying sports events in the company of friends and family, and to have movies and kids’ TV shows accessible from a simple touch-screen controller. Support for 3D was a must, too. There are revolutions in progress going on in the Arab world at the moment, but they’re no more stunning than the work done on this Arabian Nights-themed install by St Albans-based FAB Audio Visual (and not a shot was fired).